In part 1 of this article, we discussed concept of Email as a Service, and benefits it can bring. In this part we will talk a bit more about three leading and upcoming providers in this market -Sendgrid, Mailgun and Postmark. Each of these companies have their own set of unique features, and I will review these, along with the pricing and an inside look. These providers were selected by the fact that they all cover the important parts like SMTP hosting, inbound mail, scalability and analytics, together with many ways to integrate their service into your app (which can be a mobile app, or a website app). We’ll start off with Sendgrid, which can be considered the largest player in this market. They have some pretty impressive customers like Pinterest, Spotify and FourSquare. SMTP hosting seems to be their core business, even though they also provide inbound mail. They give you lots of choice with their pricing plans, while the other companies provide a more simpler pricing. Sendgrid’s massive infrastructure makes sure they can always handle your email volume, no matter how much you want to send. What sets them apart is that from a relatively low price commitment, you can get advanced stuff like a dedicated or multiple IP address(es), or even IP white labeling. In features they are close to Mailgun, and their scale and customer base has to convince you they’re a good fit. The ability to process inbound mails is offered by Sendgrid, which can be used to handle replies from within your app. You can specify a hostname for your inbound mail domain, and after that you can integrate it with their API into your app. You can use JSON or XML for adding, editing or removing an entry. You can have incoming mails checked for spam before being parsed. There are no statistics for your inbound mail. 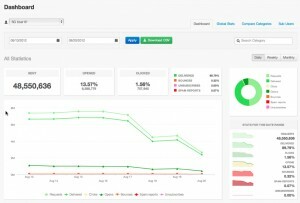 Sendgrid offers you the option to integrate Google Analytics, and provide an extensive set of reporting in their interface. 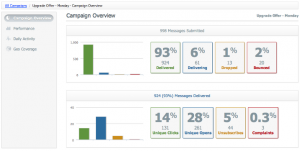 They have a dashboard to display email metrics like sent mails, and open and click rates. And you can open reports to find out more about your spam reports, unsubscribes, bounces etc. There is an option to combine all these parameters, and dive into a specific time frame to see how it all works together. It’s quite extensive, and it should give you a good feel about your email handling. Sendgrid offers a clean interface, with everything neatly divided into interest areas. They make it easy for you to select what you want in an email service, segregated as apps which you can add to your service. This is also where you should look if you want to send an newsletter, because this is an app too. Overall their interface is easy to work with. Sendgrid’s pricing is quite similar to that of Mailgun, and you are looking at a $80+ monthly commitment if you want to all the professional goodies. Prices per 1.000 emails are ranging from $0,85 to $0,45 and even lower if you send more than 1.7 million emails per month. Acquired by Rackspace.com recently, Mailgun is becoming a serious contender in the Email as a Service market. They have a wide range of features and competitive pricing. Their customer base is not as impressive as Sendgrid, but has some nice names like Uservoice and the Financial Times. Their pricing is mostly based on send volume, instead of features, except for professional features like a dedicated IP. You get all the features right away, even with their free plan. The only difference with their higher paid plans are the IP addresses (shared) and DKIM signing (Mailgun’s). But that’s no problem when you’re just starting up, and want to keep your overhead low. Mailgun offers all the features described in part 1, and is up to par with Sendgrid on their more expensive plans. This is also their main selling point, giving you pro features right from the start. Mailgun offers you two ways for accepting inbound mail. You can set up a mailbox within Mailgun, which works like a normal email address. You can use this for a specific function, like for example adding a calendar event from within your app or ordering items. This triggers an email to your specified email address, which can be fetched with POP and IMAP after which your backend can process it. You can also use “Mailgun Routes”, where you define a list of sequenced routes to process your incoming mail. You can have the message stripped from signatures and replies, and have it forwarded to an URL via HTTP or a different email address. This can be used for triggering a specific action after a message is filtered based on one or more expressions. This gives you more flexibility in processing your inbound mails. All the basics are here, but not as fancy as Sendgrid’s. There’s an overview for all the important metrics like open and click rates, bounces and unsubscribes. And that’s about it actually, that is for the normal mail processing. The secret is in their campaign module, which has some nice features like daily activity charts for what’s happening in the receiver’s inbox and even reporting on geo coverage. Mailgun shows what it’s got right after you login when it comes to their main functionality. This might come as a bit overwhelming, but saves you the search. And once you get the hang of it, you might appreciate this approach. Because their really detailed features are uncovered after you set up things like a mailing list or a mailbox. So you’re only shown what you need at first. Like mentioned above, Mailgun’s pricing is really straightforward Pricing is based on a monthly commitment, and raising your commitment gives you a lower price per mail, and more professional features like (up to) a dedicated IP subnet and custom DKIM signing. Pricing ranges from $1 tot $,10 per 1.000 mails. New kid on the block Postmark tries to battle the competition with a one price fits all attitude, and a sales which actually doesn’t say anything about their features. They try to assure you that their experience and technical skills are all you need, using layman’s terms to describe what they are offering. Their customer base has some interesting names like Tender App and Readability. Postmark has some nice features like a weekly digest reports with your important metrics, but also a WordPress plugin for easy integration. They also provide a Spam Score API (based on SpamAssassin), which you can use for both your outbound and inbound mail traffic to have it checked for spam. Using it for your outbound mail before a message is sent is a good prevention for being marked as spam. There is no option for sending a newsletter. The ability to receive inbound mail is fairly new within Postmark, and they are actively expanding its features. Every mail is parsed into a JSON object for you to have it processed (as a with outbound mail, you can run it through their Spam Score API first). You can also set up an MX record to use your own domain name for receiving mail. Postmark offers some nice looking graphs, which give you a quick view into your sent and received mails. It also includes your bounce rate and number of spam complaints. You can also keep track of your statistics by using their API. Talk about a clean interface, Postmark starts with nothing but the ability to start a server, a dedicated mail processor for each app you have. After that you can send an email with their API as an HTTP request (using JSON), or via SMTP. In the interface you can setup hooks to give a signal when an email bounces, or send parsed JSON data from inbound mail to have it processed in your backend. Most of the setting up is done using the API however. As stated Postmark just offers one price, being $1,50 per 1.000 emails, up to a volume of 500.000. All of their features are included in this price. Sendgrid and Mailgun are in a neck and neck race when it comes to features and price per mail, but offer a different pricing strategy. Their interfaces are quite different, but both offer a free plan for you to see what you prefer. Postmark has basic set of features to begin with, but is definitely catching up with it’s competitors. Let me know your thoughts and views based on your experience.